This year marks the 100th anniversary of a scientific breakthrough that fundamentally changed our world. In 1915, Albert Einstein presented his theory of general relativity, which proposed that gravity itself was the result of a warping of spacetime by massive objects like stars and planets. He was 36 years old and already quite famous in the world of theoretical physics, most notably for his theory of special relativity, which proposed that the laws of nature are the same for all nonaccelerating observers everywhere—and that the speed of light is constant (also, E=mc2!). At the time, these ideas rocketed Einstein to worldwide fame. Today, they're the basis for much of our understanding of the universe. At the World Science Festival last week, the premiere of the stage performance Light Falls: Space, Time and an Obsession of Einstein shed new—well, you know—on Einstein's historic 1915 discovery. 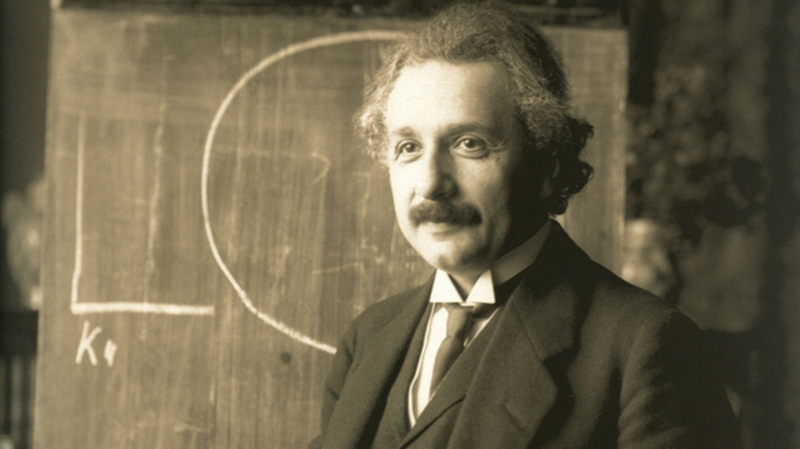 Led by physicist Brian Greene, the show featured a dramatic (and historically accurate) account of Einstein’s journey toward the incredible breakthrough. In celebration, here are a few things we learned. 1. A Compass Provided Early Inspiration. When he was 5 years old, Einstein’s father gave him a compass. The instrument enthralled his curious young mind, as the needle always pointed north regardless of its position. The boy asked himself, "How?" And thus began Einstein's lifelong journey to understand unseen forces. "That experience made a deep and lasting impression on me," he later wrote. "Something deeper had to be hidden behind things." Another common instrument inspired Einstein too. At the turn of the 20th century, while young Albert was a clerk at a patent office in Bern, the world was becoming more technologically advanced and connected. It became increasingly important for clocks in faraway cities to agree on the time. Figuring out a way to synchronize the world’s timepieces led to many proposals that likely passed through Einstein’s hands. His own take on the problem was inspired by his lifelong fascination with light. He reasoned that if you could used light signals to coordinate and account for the infinitesimal travel time for the light to deliver the message, you could synch clocks pretty easily. But Einstein realized that two clocks moving at two different speeds—say, on two moving trains—wouldn't be able to precisely synchronize. This understanding of the relativity of time was an integral step in the development of his later theories. 3. The Constancy of the Speed of Light Was a Huge Breakthrough. While clocks can travel at different speeds, light can't. That's what Einstein postulated in 1905 with the special theory of relativity, which says the speed of light is constant. We take it for granted now, but at the time, this theory was radical. While supported by James Maxwell’s equations, the idea flew in the face of Newtonian physics. The concept that anyone in the universe, regardless of their own speed, would measure the speed of light as 300,000 km/s, meant that light behaves unlike anything else we know of. This core insight took him a step closer to the theory of general relativity, which essentially simply adds gravity to the equation. Special relativity put the burgeoning scientist on the map. 4. He Found Happiness in Strange Things. In 1907, just two years after Einstein published the special theory of relativity, he had the “happiest thought of his life.” It wasn’t about a loved one, a remembrance, some sense of self satisfaction, or even the poetry of the cosmos. It was about a man falling from a building. Einstein realized that a man falling alongside a ball would not be able to recognize the effects of gravity on the ball. Again, it’s all relative. This connection between gravity and acceleration became known as the equivalence principle. 5. His General Relativity Drafts Are Contained in a Notebook. When Einstein died in 1955, a small, brown notebook was found among his papers. It contained within it the notes he was taking while working through the ideas of general relativity from the winter of 1912 when he moved from Prague to Zurich. The Zurich notebook contains amazing bits like a modified four-dimensional Pythagorean theorem to account for the curvature of spacetime. The notebook also contains traces of Einstein’s mistakes (yes, even he made them). Wrong assumptions and dead ends are all contained in the pieces of aged graph paper. All were part of the path to greatness. 7. ... and a Frenemy Who Accused Him of Stealing It. David Hilbert was a fellow scientist and friend of Einstein’s—until their relationship took a negative turn leading up to the publication of the theory of general relativity. Hilbert too developed a theory of general relativity—and even published it five days before Einstein. What started as camaraderie and a supportive exchange of ideas turned into a bitter rivalry that included accusations of plagiarism. Since then, historians have examined the proofs and say that Hilbert’s lack certain key ingredients to make the theory work. In other words, history got it right: the cred belongs to Einstein. Oddly, a portion of Hilbert’s proofs are missing, with no indication of what they might have held. 8. The Introduction of the Theory Was Huge. In November 1915 Einstein presented his masterwork to the Prussian Academy of Science, wherein he introduced general relativity and what are now known as the Einstein field equations. The paper was published the following year, and while the man and the concepts received great attention (after all, Einstein was already a well-regarded figure), it wasn't until he was able to confirm the predictions that he became a towering figure in scientific achievement and a worldwide celebrity. It was a big moment for Einstein. He'd synthesized the ideas he'd been working on for 10 long years. Now he had to show the world he was right. 9. The Sun Helped Prove Him Right. As any good scientist knows, an unproven theory isn’t science, it’s philosophy. Einstein needed his equations to make accurate predictions about the behavior of objects in space. One of his conjectures held that light traveling near a large gravitational field should curve. To test it, Einstein needed the help of a solar eclipse, which would facilitate the view of starlight passing through the sun’s gravitational field. On May 29, 1919, in a test conceived by astronomer Sir Frank Watson Dyson, and with the help of Sir Arthur Eddington, astronomers were able to take pictures to compare with their "true" location and measure the bend of light of 1.75 arcseconds—the very number Einstein’s theories predicated. “LIGHTS ALL ASKEW IN THE HEAVENS” read the November New York Times headline. From that moment on, Einstein was a superstar. 10. General Relativity Explained Mercury's Weird Behavior. The general theory of relativity’s ability to explain the precession of the perihelion of Mercury—the change in orbital orientation the planet experienced when closest to the sun—gave Einstein another opportunity to test his theory. When it neared the sun, Mercury didn't behave as Newtonian physics predicted it should. The problem had baffled scientists for years. The behavior of gravity as laid out in the general theory explained these discrepancies. His understanding of how mass warps space ended a 200-year-old mystery about our celestial neighbor. 11. His Scientific Papers Became Front Page News. Once general relativity theory had been proven, Einstein skyrocketed to fame in a way that’s hard to imagine today. His papers were published in their entirety on the front page of newspapers like the Herald Tribune and pasted in department store windows where people would clamor to read them. 12. The Discovery Made So Much More Possible. One hundred years later, the impact of the general theory of relativity is almost too massive to quantify. It’s why we have GPS, and it’s paved the way for our understanding of black holes and dark matter, the Big Bang and its immediate aftermath, and the discovery of our expanding (and accelerating) universe. It doesn’t stop there: we’re still waiting to see things like gravitational waves—little ripples in the fabric of spacetime—predicted by general relativity. Perhaps most importantly, the theory was a step that may one day lead to a grand unified theory that will complete the picture of the universe that humans have been trying to piece together since the beginning of our existence. Einstein’s one small step was a giant leap that we’ll spend perhaps another 100 years trying to match.